Within Hollister? 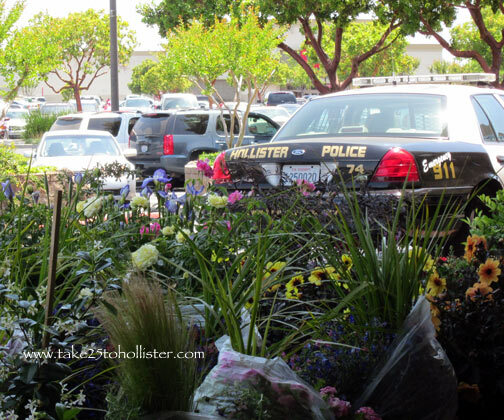 That would be the Hollister Police Department. Outside of city limits? 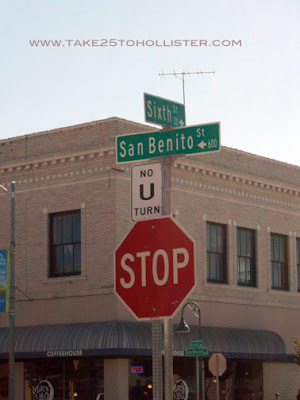 That jurisdiction belongs to the San Benito County Sheriff's Office. There will be a Hollister Neighborhood Watch Meeting with Police Chief David Westrick on Tuesday, June 12, 2012 at 6:30 p.m. It will be at held at the Hollister Police Department at 395 Apollo Court, which is in the Hollister Business Park, across from the Hollister Airport. The meeting is open to all. Hollister Neigbhorhood Watch Group: Police Chief Westrick actually answers questions posted by group members. Holding the upcoming Neighborhood Watch Meeting was a result of the Chief posting back and forth with folks at the page. 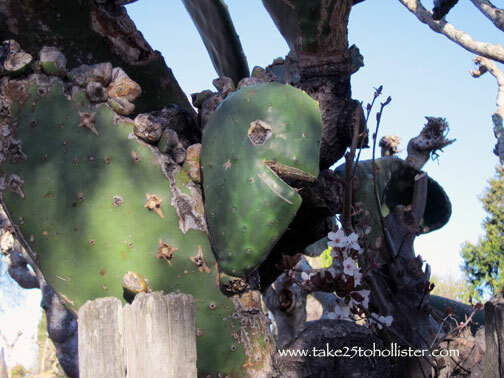 Here's a little bit more of Hollister for you. Memorial Day was originally called Decoration Day. First celebrated on May 30, 1868, the day was established to honor all Union and Confederate solders who died in Civil War. The day was chosen because it did not signify a day of any battle. Over time, Memorial Day became the day to commemorate the deaths of all U.S. military personnel who served in any U.S. skirmish, battle, war, and other military conflict. 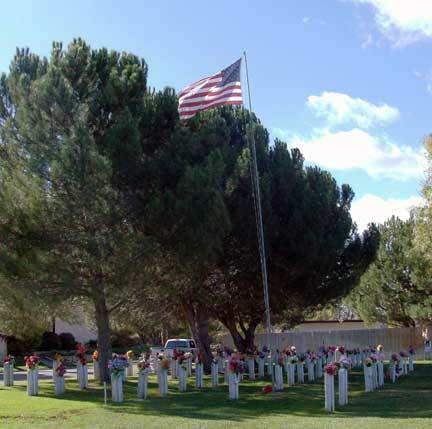 As a kid, I remember the local American Legion and Vets organizations holding an annual Memorial Day commemoration at the cemetery on Hillcrest Road. I have no idea if it's still happening. If anyone knows, please leave a comment. Two big events are happening this weekend. 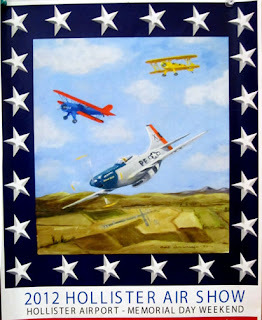 There is the annual Hollister Air Show (May 26 and May 27) at the Hollister Airport. 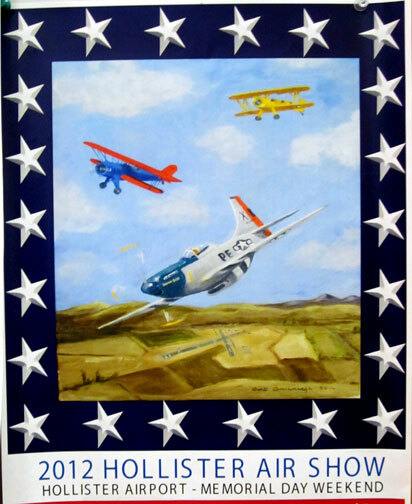 Lots of daring do's in the sky will be taking place. And, there is the Portuguese Festival. The crowning of the queen and her court will take place on Saturday evening (May 26). The following morning, the annual parade will start off Sunday's full day and evening of festivities. To learn about other events going on this weekend (and later), check out San Benito Today's calendar. How many of you noticed the sky suddenly looking dark for a short while late Sunday afternoon? Did anyone notice that the birds stopped chirping for a little bit? 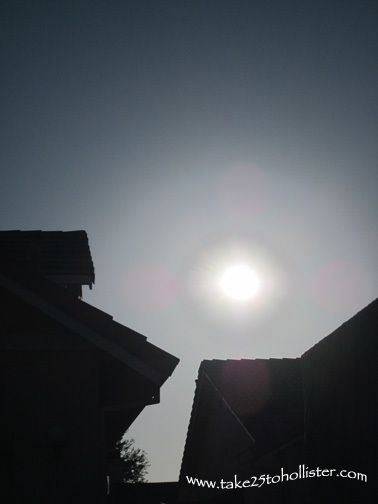 And, how many of you went outside and watched the annular solar eclipse? Not directly, of course. The Husband pricked a hole in a piece of notepaper and held it up to another piece of paper. 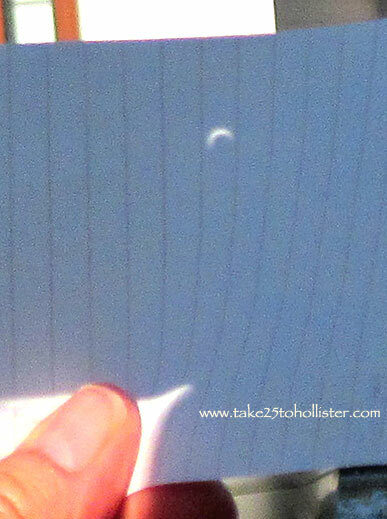 I thought it was quite impressive, both the pin-hole viewer and the eclipse. So, I can just imagine how supercalifragilisticly magnificent it would have been to see the ring of fire. But then that would be the last thing I would see. As the Husband gazed at the image of the eclipse on the paper, I poked my camera towards the sky. (No, I didn't look at the sun.) I was shooting in color but the image came out in black-and-white. I guess that's how dark it really was at that moment. By the way, if you want to know the scientific particulars about the annular solar eclipse last Sunday, check out this link at the National Geographic. Be Part of the Cash Mob! A Cash Mob is happening this Saturday, May 19, at one lucky random business in downtown Hollister. It's a new strategy that's going on nationwide to support local businesses. A "mob" of people choose one store and each person spends at least $20 there. The store has no idea its going to be mobbed with customers. 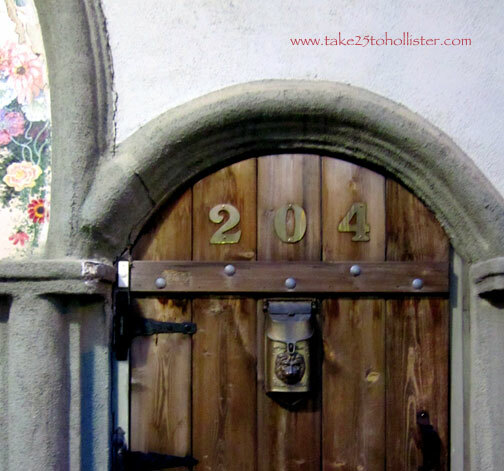 Hollister Downtown Association (HDA) is hosting Saturday's event. Interested? Show up at the parking lot on the corner of Sixth and East streets at 11 a.m. with your 20 bucks. From there, you and the rest of the mob will head to the selected business. HDA isn't saying until then. For more details, check out this link. I was not even thinking taste when I saw these small eggs. They were just so cute! I was thinking about a way to remove the insides so I could have the shells intact for. . . Sigh! Crafting will have to wait for another day. 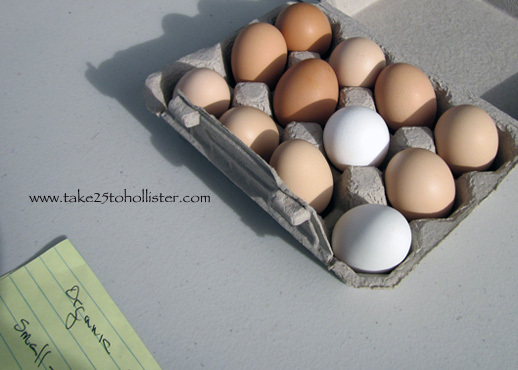 Eggs from the Hain Ranch Organics are always top quality, as far as I'm concerned. (So are its chickens, by the way.) But, that afternoon at the first Hollister Farmers Market, I didn't need any yummy eggs. So, I took a photo of the cute eggs and bought myself a pound of the local family farm's delicious organic walnuts. Hain Ranch Organics is one of the several local farmers who sell their wares every Wednesday afternoon (3 to 7 p.m.) at the Hollister Farmers Market. Have you had a chance to check the market out yet? Click here to see the market's photo album of its 2012 opening day. Are you interested in checking out the latest green products? Then head on over to the streets of San Juan Bautista for the Touch of Green Expo this weekend. According to the flyer, it will be: "A two day family event — with activities, vendors, children's playground, food, entertainment, displays, information, a 'Touch of Green' and more." The Touch of Green Expo will take place on Saturday May 12 (10 a.m. to 6 p.m.) and Sunday May 13 (10 a.m. to 5 p.m.). It will be free. Boxing fans: Robert The Ghost Guerrero will be there to sign autographs. Music lovers: There will be a Touch of Green concert on both days at Abbe Park. The cost of that is not free. Check out this page for more details. For more details about the weekend, head over to the Touch of Green Expo Web site or Facebook page. Looking south from the corner of Industrial and Gibbs Drives. See the wall. That runs along Highway 25 between Hillcrest and Sunnyslope. The generous gift baskets that will be given to 15 lucky customers who check out the second annual San Benito Spring Shop Hop this Saturday, May 5. The baskets include local products (such as wines and chocolates) and gift certificates to local restaurants, shops, and services) that were donated by over 60 businesses and nonprofits in San Benito County. The cost of the entry fee is free. Yep, you read that right. Free! You enter the raffle at participating businesses on Saturday. Not that we need an incentive to check out and support the local businesses. Right, folks? Still, I appreciate the chance of sampling local products and services for free. So, here you go. The list of local restaurants, shops, and organizations that will be opening their doors at this year's Spring Shop Hop. By, the way, some of the businesses will also have their own raffle baskets for customers. 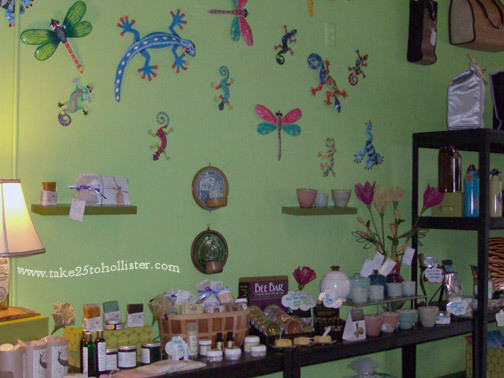 To get a list of all the local businesses that are participating, check out the San Benito Spring Shop Hop page at Facebook. You can also find more info about the Spring Hop there. That's the Swank Farms sign on San Felipe Road. It's pointing the way to its produce stand, which, unfortunately, is still closed. 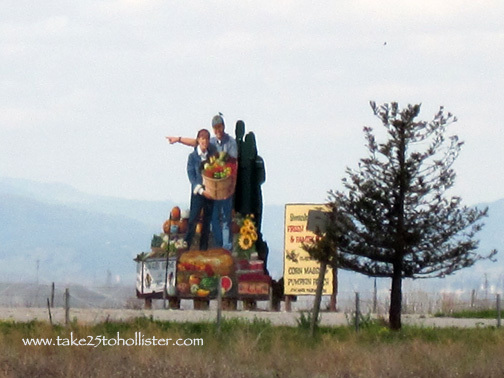 However, I like to think that right now the sign is pointing to downtown Hollister. Yep, 'cause tomorrow, May 2, starts the Hollister Farmers Market, and you'll certainly find the Swank Farms there with their yummy produce. 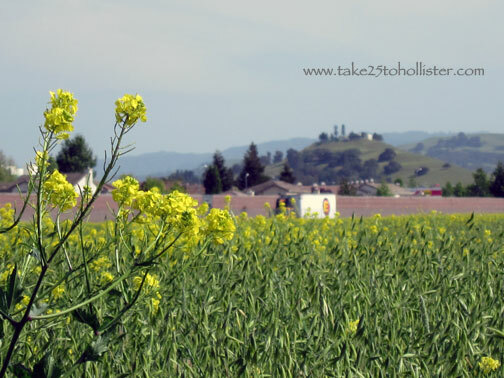 The Hollister Farmers Market runs every Wednesday, from 3 to 7 p.m. all the way up to September 26. Same place: Fifth Street, between San Benito and Monterey streets.